Oh! 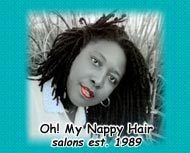 My Nappy Hair Salons originated in California over 25 years ago. As industry pioneers, we have become best known for our leadership and niche expertise in the education, styling and maintenance of healthy, Nappy Hair. Our master stylists, also proudly referred to as "Nap Specialists," are equipped with years of professional natural hair care knowledge, providing clients with premium and extraordinary hair care solutions. Offering extensive knowledge and creativity with all hairstyles, from dredlocks to bone-straight hair to each client, is fundamental here at Oh! My Nappy. We do not discriminate when it comes to the many great hair textures God has created, natural (non-chemical) hair, thermally or chemically processed hair. As a matter of fact, we pride ourselves with the ability to tackle what often proves to be the most difficult of hair challenges. Our innovative natural hair techniques were specifically developed to maximize the dynamic results we achieve. We always aim to please you in a professional and inviting atmosphere with stimulating conversation and top quality service! HEY ATLANTA! ...BOOK YOUR APPOINTMENT ONLINE NOW !